Despite the fact that it meant I’d be awake for 24+ hours in a row, I still ventured to Saint Rocke last night to see the amazing Anna Nalick. I’d always been a fan of Ms. Nalick…since Wreck of the Day, an album that I believe to be pure brilliance. Everyone knows her for her hit song “Breathe (2am)”, but that tune is barely in my top five from that album. She has been playing residencies at The Hotel Cafe more recently and I finally got out to one of her sets a couple of weeks ago. Let’s just say, the performance was not what I expected…it was more than some musicians up on stage playing some songs, it was a show! Anna has her stage set up around a plush chair that bears slight resemblance to a throne. Next to the chair is a stand holding a fancy book and a table…with a flower. She takes the stage, a tiny figure, unassuming save for the wide eyes and fiery red hair. She’ll play a song showcasing her sweet yet powerful vocals, emoting through to her fingertips. After the song, she’ll make the announcement that she isn’t very good with on stage banter so instead, in between songs, she’ll read some poetry she wrote just for the occasion. Her poems, as well as her engaging banter (she lied when she said it was no good), quickly bring you into her world more so than I think I’ve seen with any other musician on stage. Not only is the forth wall smashed to smithereens, but the audience is transported not just onto the stage but into the mind of Anna Nalick. She complains about every crack in her voice (even redoing bits of songs to prove that she can do it), freely informs you that she suffers from depression, may have multiple voices in her head, and is unashamed to announce that her songs are brilliant. For last night’s performance at Saint Rocke, she wrote one long poem that she broke up into smaller segments. She claimed it was the answer to the questions she always gets about where she’s been since her smash hit was released. It was a story of kings and castles, of a brave knight and a little girl who wrote songs…a thinly veiled tale of how a record label can mess with an artist, but definitely the most entertaining way I’ve ever heard the storytold! I suppose the bottom line, and most exciting part, of last night’s tale was that the little girl is still writing brilliant songs. And those songs are soon to be released!! In the meantime, I know that I will try to catch as many Anna Nalick performances as I can. Each one is a unique experience, guaranteed to enrapture and entertain, giving you insight into the mind of an artist who is fast becoming one of my favorite lyricists as well as performers. 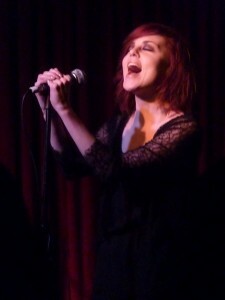 Anna Nalick’s final two Hotel Cafe Residency dates are Feb. 2nd and Feb. 9th. Don’t miss it! Posted in Show Recap-LA and tagged Anna Nalick, poetry, Saint Rocke, The Hotel Cafe, Words, Wreck of the Day on January 26, 2011 by Kristen.